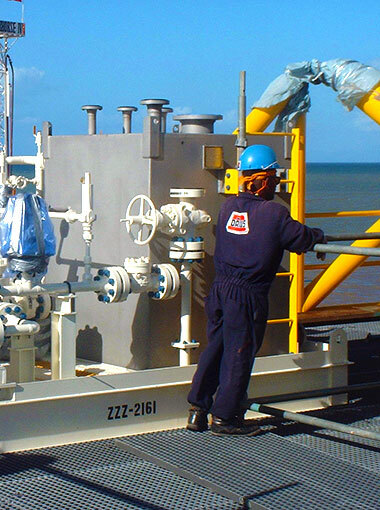 Mechanical Fabrication, Maintenance and Construction - DAMUS Ltd.
Our clients are comprised of the major operators in the Trinidad and Tobago Oil & Gas, Petrochemical and Electrical Generation segments of the energy sector and the primary marketing and distribution, mining and refining companies in the wider Caribbean region, Guyana and Suriname. Our customers are not only our priority but also our strategic partners on the projects and maintenance works we undertake on their behalf. The hallmark of our customer service and satisfaction is repeat business and we have maintained a high degree of client confidence and long standing business relationships over the years. Where necessary, our services are enhanced through strategic relationships with local and international firms which facilitate the mobilization of certified, experienced and technical expertise within minimum timelines to engineer, plan and execute technical and schedule intensive projects. At Damus we actively seek to create value for our clients and minimize cost through efficient management of resources, reduction in waste, minimizing re-work, and continuous improvement through lesson learnt strategies. The emphasis we place on safety, quality, team work and performance excellence ensures that we are able to provide viable solutions in a competitive environment while adhering to the highest integrity standards. Damus continues to develop strengths and capabilities in our core business areas which has also stemmed from our experience in partnering and working closely as the main service provider to multinational companies i.e. Bechtel, Samsung, and TECHINT in execution of mega projects locally. We continue to be a leader in the provision of Engineering, Procurement and Construction of storage tanks design in accordance to API 650 and 620 codes. The company continues to strategically position itself in becoming a world class multidiscipline organization as we have embarked on and signed alliances with international stakeholders such as HMT LLC, one of the leading manufacturers in floating roof and roof seals technology in the United States of America. These initiatives give us the ability to incorporate new technology continuously within our business and by extension, add value, innovation and best practices to our service portfolio. Damus provides a comprehensive portfolio of mechanical and construction services throughout the Oil & Gas, Petrochemical and Manufacturing sector locally and within the english speaking Caribbean. Provider of full turn-key maintenance services. The company has and continuously maintains a robust quality management system which is certified to ISO 9001-2008 Standard. Damus has built its reputation on a commitment of continuous improvement in HSE throughout the industry having been STOW certified since January 2012 and consistently maintaining our High Risk Certification and recently established recertification in 2015. Some of our key milestones in HSE includes the delivery of a 5million man-hours project without a LTI, consistently achieved & 1.00TRIFR over the past 5 years and maintained healthy labour relationships with both employees and union representatives. The company’s Quality Management System has been certified to ISO 9001 standard consistently for the past 16 years. Certification to this standard confirms our commitment in providing a high level of quality and service by ensuring that we manage our resources, processes, cost and risk in a systematic and transparent manner to maintain and continuously improve our overall organizational performance and capabilities for the benefit of all stakeholders. In summary, our ability and enduring presence is a testament of the company’s commitment to anticipate and manage industrial changes while delivering schedule intensive projects with our cadre of qualified professionals. Our customer-focus strategy challenges us to be responsive to our end users throughout every phase of a project, thereby continuously delivering a service that meets or exceeds client expectations.